Perfect for a long weekend, the enchanting city of Budapest plays host to historical tales, imposing architecture and lively bars. 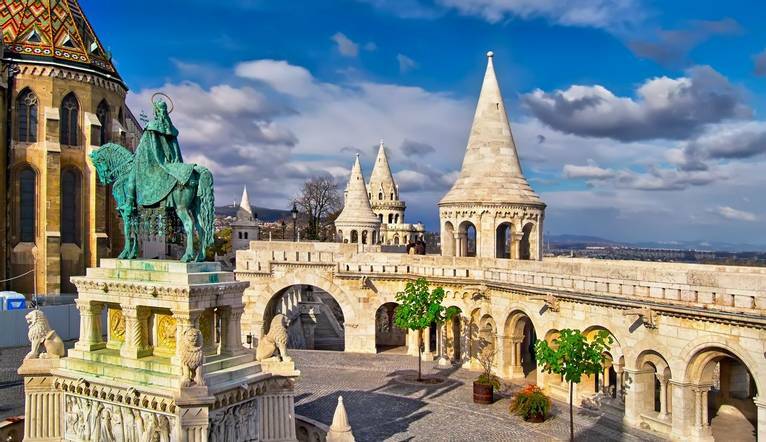 Join us as we discover this European gem and explore the fascinating contrasts between ancient Buda and vibrant Pest. Budapest is two cities divided by the majestic River Danube – ancient Buda with its quaint cobbled streets and Pest with its grand boulevards and imposing baroque architecture. Budapest combines the enchanting atmosphere of Eastern Europe with its famous historical landmarks and the specialities of Hungarian cuisine, making it a wonderful destination for our short break. Linked by seven bridges, our guided sightseeing tour gives us our first taste of this special city. Top sights include the imposing Heroes’ Square with its impressive Millennium Monument and the Castle District where the Royal Palace Mattias Church and the famous Fisherman’s Bastion can be found. Afterwards, why not indulge at the celebrated Gundel Restaurant for a taste of their famous pancakes filled with walnuts and chocolate sauce? Or, take a walk along the 2.5km Andrássy Avenue and marvel at the beautiful buildings including the State Opera House. Our hotel is situated in the heart of the Pest side of the city within walking distance of Andrássy Avenue and Oktagon Square. On a spare day, we may like to travel further afield and visit Szentendre, a small picturesque Baroque style village in the Danube Bend. Great hotel with lots of personality. Brilliant city and the trips were fantastic! Our comfortable hotel is situated in Andrassy in the centre of the city and just a 10 minute walk to Oktagon. Ideal for a weekend break with a great location with bars and restaurants nearby, facilities at our hotel include a breakfast room. Our classic bedrooms feature air-conditioning, flat-screen TV, fridge, Wi-Fi, safe and hairdryer. The transfer from Budapest Airport to Hotel Medosz is approximately 40 minutes, depending on traffic. During your holiday, we have included a guided tour of the the city. Budapest is such a lovely city with so much to see and do, your Tour Leader will be able to advise of excursions you may like to participate in or good places to visit. Your Tour Leader will be on hand to offer advice or suggestions if required but gratuities are offered entirely at the sole discretion of the individual. We suggest a group collection to cover drivers, porters and hotel staff of €20.00. Your Tour Leader will collect this on your behalf and distribute it accordingly, thus relieving you of the burden of who, when and how much to tip. The tipping of housekeeping will be left to your individual discretion (a small amount left in your room on departure should cover this and would be much appreciated). As is customary, ‘the hat’ will be passed around for the driver and guide on all optional excursions. For any meals that are not included in your itinerary, or taxi fares, your Tour Leader can advise of an appropriate to add on. Casual daytime wear is recommended. Comfortable shoes are a “must” for sightseeing. Smart casual clothes will be ideal for the evenings - the emphasis throughout being informality. Dressing in layers to allow for changes in temperature is recommended.